The I Heart Faces theme for this week is FAMILY FUN! The picture that I chose is of the Draher Family—I am sure it won’t take you long to figure out why I chose this picture for the challenge! 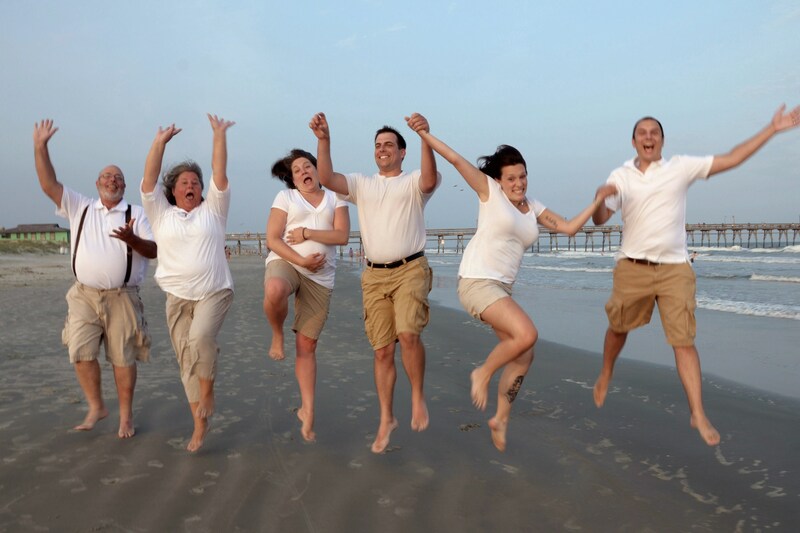 The beach, the jumping, the laughing, and the smiles…this family truly knows what it means to have fun! Dave, Kathy, Jen, Jim, Emily, Benn, and wee baby Austin (here, in the womb) – thanks for being awesome during this photo shoot and allowing me to take some goofy pictures of you guys having fun as a family! Any time I look at this picture all I can do is smile! That’s what family fun should be all about – inspiring others to have fun too! Thanks for being an inspiration for all the families reading this! If you are interested in being photographed for I Heart Faces challenges, please contact me for more information. What a fun picture. It really makes me want to head back to the beach! YES! Me too! hahaha! Thanks for checking out the site and for the comment! Hopefully you get back to the beach soon! Silly pics are so fun! I couldn’t agree more! Thanks for your feedback! It was a fun evening! Can’t wait for Austin to be tossed up in the air next time!